Inclined Screw Conveyors – Conveyor Engineering & Mfg. Co. 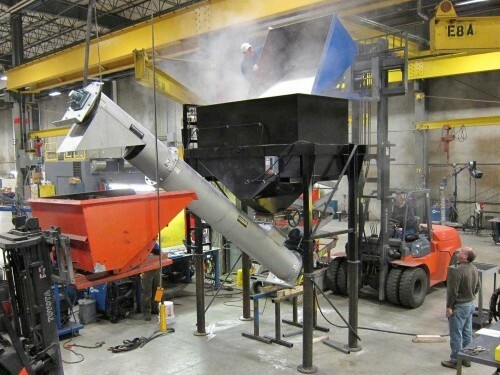 Inclined screw conveyors are used in a few different applications within the process industry. These applications include the agricultural, construction and food and beverage industries. They transport raw materials like cement, fertilizer, feed, sugar and meat. 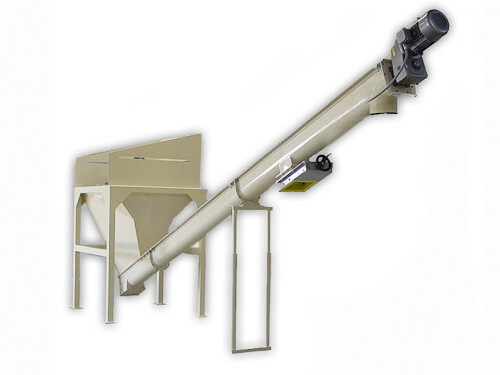 Commonly seen in the food industry, these conveyors transport ingredients to and from mixers, ovens and vats and need to be sterile at all times. Therefore, they are commonly made of stainless steel, a smooth food grade metal that is less likely to contaminate edible ingredients than other materials and is easily cleaned. Like all industrial screw conveyors, those that are inclined use a spiral, rotating screw within a trough that pushes loose material forward. Because of the incline, these conveyors are not able to transport liquid materials. Instead, they convey powders, solid food ingredients, loose mixtures and pastes. The slope of an inclined screw conveyor determines the amount of material that it may hold at one time. As the angle increases and becomes steeper, the conveyor’s capacity decreases. For example, a conveyor carrying material up a 15º angle is able to carry 75% of its horizontal capacity, while a conveyor operating at 25º holds only 50% of its horizontal capacity. Inclined conveyors should never have internal screw supports, as they obstruct the production flow. Since the material tends to fall back because of gravity it must overcome, inclined screw conveyors use trough covers and tubular housings to keep the material from falling off or spilling. If necessary, inclined screw conveyors are able to stow away in a vertical position when they are not needed, which saves storage space. They are often attached to a vat, mixer, tank, silo or oven and are most often used when material is transported from a small container to a large one that is much higher up. Because of the constant rotation of the spiral screw, inclined screw conveyors may also perform some additional blending or homogenizing during transportation. Inclined Screw Conveyors Inclined screw conveyors are spiral bulk material transportation systems that convey raw ingredients to and from processing areas that are on different levels of a facility. These conveyors are slanted at different angles to economically elevate and convey materials up and down floors. They require ample space and an increased amount of power to lift the material, depending on the steepness of the angle.